UK businesses seem to be experiencing some growth and this is likely to create cash flow pressures that can be alleviated by using invoice finance to fund business growth. Recent results from the Bibby Financial Services Global Business Monitor survey showed that 49% of the businesses surveyed had grown their turnover during the last 12 months and 55% were expecting to grow over the next 12 months. An encouraging situation for the UK economy which reportedly grew by 0.3% during Q2 2017. Some parts of Europe are growing even more quickly, which could create attractive export markets for UK exporters, regardless of the exact shape of our future Brexit deal. The issues with growth is that you can enter a situation known as "over trading". This is when a business grows at a rate that outstrips it working capital reserves. For example, if you are a manufacturing business you need to purchase raw materials, and labour, in order to produce your products and satisfy your order book. If you go through a period of rapid growth this can put a cash flow strain on the business. You may be waiting to be paid for previous supplies, whilst trying to fulfil current orders, causing a lack of liquid cash in your bank account to pay for your purchases. This is exactly the kind of situation that invoice finance can assist with. Put simply, you no longer have to wait for your customers to pay their sales invoices, despite giving them the credit terms that they require. The financier bridges the gap between raising your invoice and getting paid. This creates liquidity in your business that you can use for any purpose, including paying suppliers for raw materials, and staff wages. In a survey that we conducted, 87% of exising users of these services, said that using them had enabled their business growth. In a normal trading situation where you have multiple sales transactions, the amount of finance builds to a considerable amount. When you have an outstanding sales ledger of unpaid invoices, you might be able to free up say 85% of that cash immediately, so that you can put it to work in your business. The problem with using overdrafts and loans to fund growth is that they are fixed amounts that don't grow with your turnover. 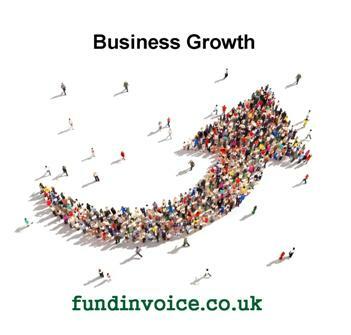 Invoice finance does grow as it is driven by the volume of outstanding sales invoices. As the value rises, so does the amount of funding you can get access to. In this way it is a perfect way of financing a fast growing company. Even if you only have a seasonal peak cash flow requirement, this kind of funding can be useful. There are selective facilities that allow you to use the funding only when you need it, controlling your costs - whilst retaining the flexibility to access more finance as and when you need it. We have produced a new, free Invoice Finance Guide that explains how these products work, how they are priced and also give you some helpful advice that any company considering using these services should be aware of.